Tate Modern tomorrow unveils a large-scale animatronic installation in the Tanks, Colored sculpture by American artist Jordan Wolfson. 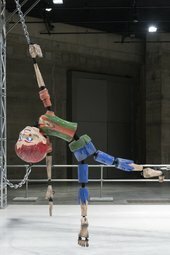 The work features a menacing puppet over 7 feet tall, which is lifted, pulled, dragged and dropped to the floor by mechanised chains attached to each limb. The figure has digital screens for eyes and is equipped with sensors which allow it to spot passing visitors and stare back at them. It is one of many new works going on display across Tate Modern over the coming months. Wolfson’s sculpture, which is being gifted to Tate by Joe and Marie Donnelly, draws upon various representations of boyhood from American pop culture, including Huckleberry Finn, Mad Magazine and Howdy-Doody. The apparent acts of violence inflicted on this figure can seem shocking, but are tempered by its deliberately crude construction of polyurethane parts. The figure can also be seen as an aggressor as well as a victim, as it mouths a cryptic list of threatening statements and fixes its eyes on viewers around the room. Alongside Wolfson’s sculpture, visitors to the Tanks will also find the renowned collaborative project No Ghost Just a Shell. This multimedia series of works began when French artists Philippe Parreno and Pierre Huyghe bought the copyright to a manga character called Annlee in 1999. A digital image with no fixed identity or context, Annlee became the subject of several works by a group of invited artists – including Dominique Gonzalez-Foerster, Anna Lena Vaney and Liam Gillick – incorporating video, sound, neon, print and sculpture. Other sculptures and installations have now opened across the Blavatnik Building, including a set of newly commissioned artworks by Rose Wylie created especially for the Granville-Grossman Members Room on level 8. Public spaces on levels 2, 4 and 10 now feature Jenny Holzer’s wall of provocative texts, Hüseyin Alptekin’s luminous shop signs, David Batchelor’s tower of lightboxes and Martin Creed’s neon declaration that ‘everything is going to be alright’. Further new displays will be installed across Tate Modern in July 2018. The Boiler House will open a room of photographs of workers from an East German clothes factory and the Moscow Metro by Helga Paris and Olga Chernysheva, a group display about artists’ responses to the HIV/AIDS pandemic, and a room showcasing Erkan Özgen’s powerful video Wonderland, in which a deaf-mute Syrian child communicates his experiences of war. The Boiler House will also feature several new sculpture displays, including intricate works woven from fibre by Mrinalini Mukherjee, a giant hair braid cast in lead by Tunga, and one of Robert Indiana’s iconic Love sculptures. These will be joined by a series of 24 paintings by Sandra Gamarra and an immersive installation by Aldo Tambellini. The Blavatnik Building will also see new displays of several artists in July, including photographs by Fernell Franco and installations by Irina Nakhova and Edward Krasinski. For press information contact pressoffice@tate.org.uk or call +44(0)20 7887 8730. High resolution images can be downloaded from Tate's Dropbox. This link will expire when the display has closed.